Bingyan Wang, Marc Sonnier and Jacqueline Kannan. Medical students and residents are choosing careers in rheuma­tology, thanks to an annual event hosted by the Rheumatology Research Foundation during the ACR/ARHP Annual Meeting. The Choose Rheumatology Experience, formerly known as the Student and Resident Experience, is a daylong event designed to help future physicians and health professionals navigate the Annual Meeting. Cultivating interest in rheumatology is essential to ensure students, residents and fellows pursue careers in the field and help fill academic and geographic shortages. Many attendees say the experience taught them much about the field and helped shape their future plans and goals for treating patients. The Foundation developed the Choose Rheumatology Experience event to encourage students and residents in areas of the U.S. underserved by rheumatology professionals to consider a career in the field and better serve patients with rheumatic disease. According to the ACR’s most recent workforce study, demand for adult rheumatology care exceeded supply by 36% in 2015—and the gap is only expected to grow in the future. By 2025, about 3,800 additional rheumatologists will be needed to meet patient demand. This is particularly alarming when you consider the most recent arthritis prevalence report from the Centers for Disease Control and Prevention, which shows that the number of Americans living with arthritis is at an all-time high. Currently, one in four Americans lives with some form of arthritis, and by 2040 that number will reach 79 million. Many of the students and residents who attend the event say they are ready to be part of the solution. During the daylong program, experienced rheumatologists discuss the reasons they chose the field and speak to the crowd about their subspecialties, such as pediatric rheumatology. Attendees also tour the poster hall and attend recommended talks to learn more about the latest discoveries and research transforming rheumatic disease care, as well as clinical applications that will improve patient health. 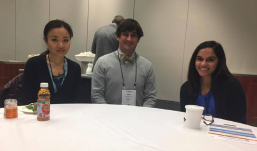 Among the attendees of past events were recipients of the Foundation’s ACR/ARHP Annual Meeting Scholarship, which offers complimentary registration and travel expenses to students and residents from areas underserved by rheumatology professionals to attend the ACR/ARHP Annual Meeting. In addition to scholarships to attend the ACR/ARHP Annual Meeting, the Foundation’s Annual Meeting awards offer medical students, graduate students, residents and pediatric fellows an opportunity to experience the field firsthand and present an abstract at the meeting. By engaging young minds and building interest in the field through events like this, the Foundation is investing in the future of rheumatology.